Throughout the next months, the Smithsonian Institution Archives will feature posts related to the Smithsonian and the Civil War in honor of the 150th anniversary of the American Civil War. Throughout her life, Dorothea Lynde Dix (1802–1887) worked in many different occupations to improve the lives of the less fortunate. Dix’s devotion to caring for others was evident from her youth. From an early age, Dorothea was a caregiver to her two younger brothers, and later, to her grandmother. At only fifteen years old, Dorothea began a small school for girls, who were not welcome in public schools at the time. Dix continued to teach for many years, until a troubling experience in a Massachusetts jail influenced her to take up a new cause. Emboldened by her observations of the appalling conditions that mentally ill prisoners were subjected to, Dix visited other prisons throughout the state and successfully petitioned for improvements. She then travelled throughout the US and parts of Europe evaluating prisons and mental hospitals and advocating for better treatment for the mentally ill and less fortunate. She was a caretaker for her family, a school teacher to girls, and an advocate and reformer for the mentally ill. In addition to this impressive list of efforts, during the US Civil War, Dix volunteered her services and directed a body of nurses to minister to injured Union soldiers. 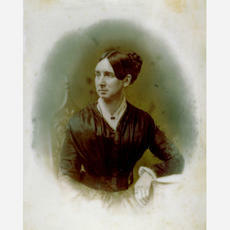 This Women’s History Month we commemorate the altruistic accomplishments of Dorothea Dix, who, we discovered, had an interesting connection to the Smithsonian Institution’s first family. In 1848, she requested that the US Congress set aside lands across the country for facilities for the mentally ill, which initiated legislative deliberations for many years to come. 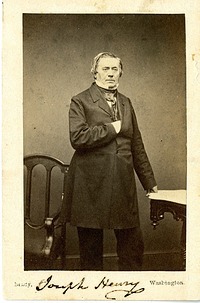 During these years, Dorothea constantly visited Washington, DC, to negotiate with Congress, and became a close friend and frequent house guest of Joseph Henry, first Secretary of the Smithsonian Institution, and his family. In 1852, Congress finally succeeded in establishing the Government Hospital for the Insane in DC, today known as St. Elizabeth’s Hospital, which formally opened in 1855. 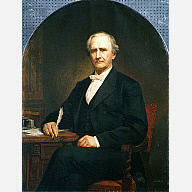 In 1863, Joseph Henry was appointed to the board of the hospital, and remained a member until his death in 1878. At the start of the Civil War in 1861 Dix was inspired to aid the war effort. On April 19, when a Massachusetts regiment en route to Washington was attacked by a secessionist mob in Baltimore, Maryland, Dix immediately took action. She took a train to Baltimore intending to help care for the wounded, but found improvised hospitals already providing aid. She then continued on to DC where, on the same day as the attack in Baltimore, she offered her services as a nurse at the War Department. Though she had no formal medical training or experience, Dix was made Superintendent of the United States Army Nurses on June 10. She quickly and adeptly acquired medical supplies and selected and trained nurses to administer to DC hospitals. Dix was a strict captain, requiring that all of her nurses be over thirty, plain looking, and wear dull uniforms. She earned a reputation for being firm and inflexible, but ran an efficient and effective corps of nurses. Though extremely busy during the war, Dix did stay in contact with her friends the Henrys. On one occasion in 1861 she visited Joseph Henry to discuss "business connected with the storage of articles for the invalids." Henry noted her exhaustion, and asked Dix why she had walked over instead of riding in a horse-drawn wagon, to which she replied that "her expenses were so great in the way of her sanitary operations that she could not afford to hire a carriage." The following day Henry wrote to Simon Cameron, the Secretary of War, to request that the War Department furnish a one-horse wagon for the use of Dorothea, who was "devoting her time and pecuniary means to the welfare of the army of the United States and with exertions far beyond a prudent regard for [her own] health." Cameron approved of Henry’s suggestion and shared the note with President Abraham Lincoln who did the same. But when a carriage was offered to Dorothea Dix she refused, in keeping with her charitable nature. She wrote to Cameron "I give cheerfully my whole time, mind, strength and income, to the service of my country," and would not "receive any remuneration for what I cheerfully render as a loyal woman." Dix served as Superintendent of Nurses through the end of the war in 1865, at which time she returned to her work advocating for the mentally ill. She continued this service until her death in 1887. Also see So Much Need of Service: The Diary of a Civil War Nurse, a 2011 exhibit at the Smithsonian’s National Museum of American History, which highlights the diary of Civil War nurse Amanda Akin, to learn more about the lives of Civil War era nurses.